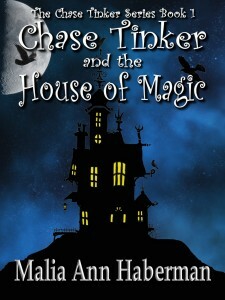 Today we have a sneak peek from Chase Tinker and the House of Magic, the Middle-Grade/Tween Fantasy novel by author Malia Ann Haberman. In this fun, thrilling adventure, 13-year-old Chase Tinker and his brother Andy find out the truth about their family’s magical heritage from a grandfather they thought to be long dead. He invites them to visit him in his magical house – a house where every room has its own unique power. When there, they learn their family’s magic comes from a mysterious “Relic” and that they have a Dark Enemy who will do anything to get their hands on this Relic. Now Chase must discover a way to stop these evil beings, find his missing dad, and unravel even more family secrets. This book is available from Amazon, Barnes & Noble, and Amazon UK. They bolted down the road, their flashlight beams bobbing. Chase grasped Andy’s arm and dragged him to help his shorter legs keep up. The sounds of pursuit echoed behind them, and they were still a ways from home. Slipping into the dark woods, he shivered as the chill from the damp ground and mossy trees surrounded him. With the thorny blackberry vines grabbing at everyone’s skin and clothes, Chase led the way to a small clearing. A rickety old shed was there in front of them, leaning as if ready to topple at any moment. Chase opened the sagging door. The kids’ shoulders drooped when they saw it was crammed with cracked, splintery wood, a rusty tricycle, several old tires and a paint-chipped door with the hinges falling off. Brushing aside dusty webs, she climbed behind the crusty woodpile into the space she’d created, which was much larger than the outside of the shed. The others followed, wrinkling their noses at the smell of rotting wood and mold. Shutting off their flashlights, they huddled together and tried to calm their ragged breathing. “Won’t whoever’s out there fit in here too?” Andy whispered to Janie. “I made it so it looks bigger to only us,” she whispered back. “I’m worried the whole place might cave in on us,” muttered Persephone. Everything was quiet for a few minutes, then they heard the crunching of breaking twigs and the rustling of leaves and brush. Chase held his breath as the door creaked open. Persephone’s hand squeezed his arm. In the moment the door hung open, he could have sworn he saw a glint of blond hair as he peeked through a crack in the woodpile. The door slammed shut and the footsteps faded away. Chase’s legs began to cramp from crouching for so long. More lightning and thunder flashed and boomed as the storm moved closer. He now understood what his last premonition had been about. If only he’d found out more at the time, then maybe they wouldn’t be squatting in an old, spidery shed, hiding from some insane stalker. “I’ll go see if it’s safe,” said Chase. Although, if he had his choice, he’d rather be lounging in a comfy chair in Grandfather’s study.